7.detached chain stitches are worked on the longer stitches in the first row. This stitch is whipped with copper thread in the second row. 8. after adding beads to the knotted loop stitch in the first row, and with the chain stitch curve ,the stitch is worked horizontally to form a leaf pattern . 9. the same stitch variation as leaf patterns continue and are worked with herringbone stitch and stem stitch in the first two rows. I tried bringing the needle four or five times out from the same hole ,this working as fan is repeated as line stitch in the last row. I was surprised by the variation worked in the last row. the knots produce a braided effect, which makes the stitch more decorative. Though an easy stitch, the knots had to be fixed to make them neat. Most of the time I did not care to do that, so my stitches are not uniform. This is still a lovely stitch which gives scope for experiments. 3. 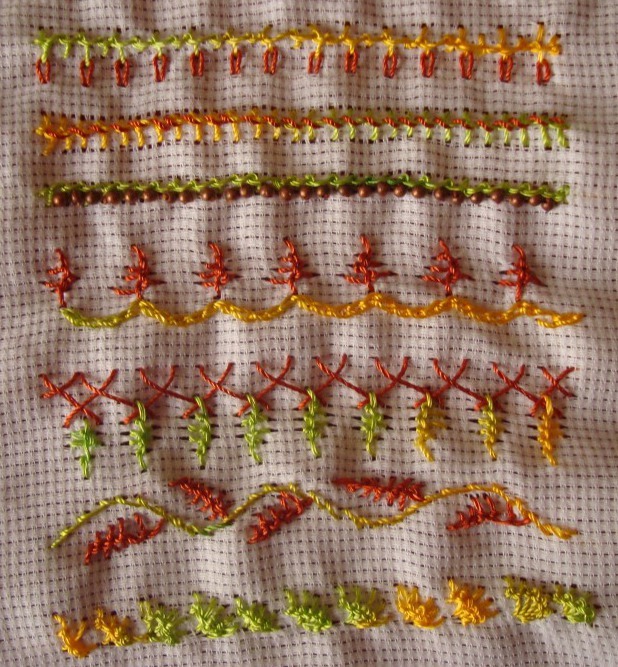 A variation of Pekinese stitch is worked over the quirky knotted loop stitch in the first row. this stitch combined with knotted buttonhole stitch forms the second row. 4.these two rows also combination stitches first row is with oyster stitch and the second row is with linked double chain. 5.first row this stitch is combined with cable chain stitch. After working a variation of the stitch, Zigzag back stitches are worked as borders in the second row. The third row is also a variation of this stitch with herringbone stitch line worked with non co-operative copper thread! 6. first row is worked with wheat ear stitch[ at least for this sampler, I remembered to incorporate this stitch] the second row is with pistil and detached chain stitches. 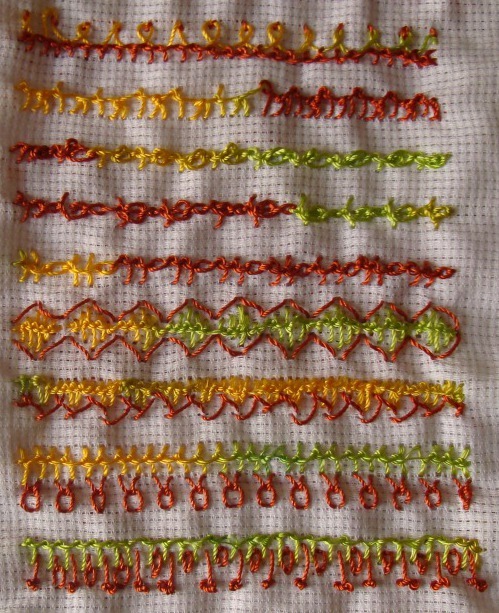 This week’s stitch of the TAST2012 stitch challenge by SharonB is knotted loop stitch. I had worked this samples of this stitch during earlier TAST challenge, but forgot about it. When I started working on this stitch, decided to check the earlier TAST challenge folder, it was all there! And done with the same cone thread too! 1.knotted loop stitch is worked over a line of Cretan stitch in the first row. 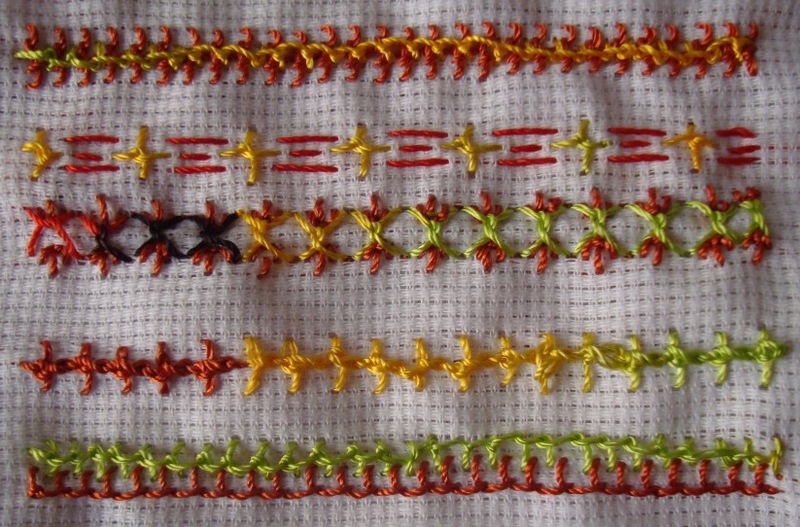 individual knotted loop stitches with running stitch is the experiment in the second row. 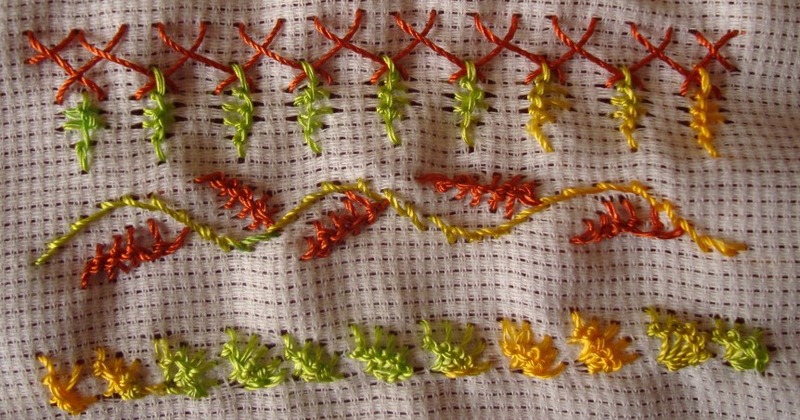 Individual knotted loop stitches done as a square and fly stitches are worked on both sides in the third row. 2.knotted loop stitch with twisted chain stitch in the first row, a line of buttonhole stitch worked below the knotted loop stitch line in the second row.